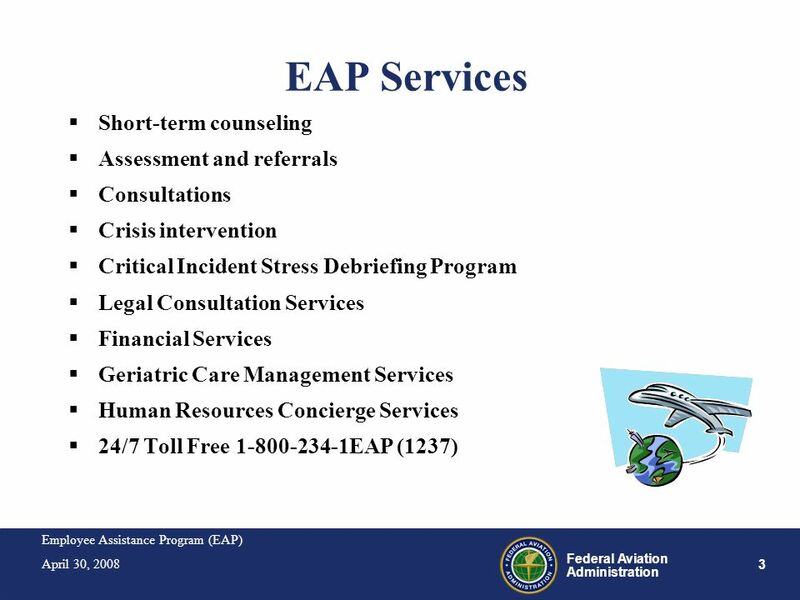 Federal Aviation Administration Employee Assistance Program (EAP) Briefing Introduce yourself, explain who you are and what services you provide. Query the participants to find out if there are any questions/issues they want to ensure are addressed during the training. Establish a “parking lot” for the questions/issues (annotate on butcher paper). 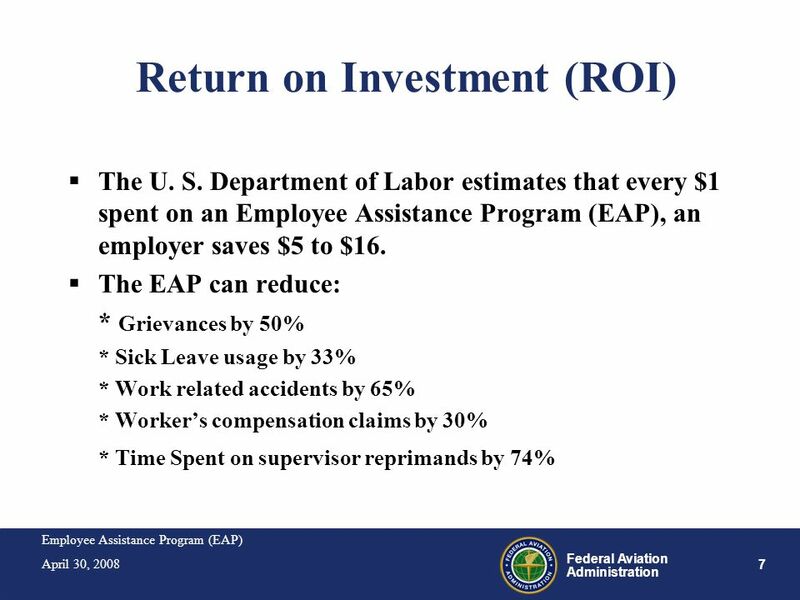 Fact: cents of every dollar of personnel costs related to employee absence stems from lost productivity, rather than hard costs – lost productivity leads to overtime, temporary staffs, etc. FY05 House Appropriations Committee Report commented that FAA’s consumption of sick leave rose in leave year 2002 and The FAA-avg (11.2 days) is 20% higher than govt-wide avg (9.6 days). Recommended with current budget constraints that FAA focus on ways to reduce sick leave, to improve productivity and lessen the need for additional staffing resources in the future. Administer Quiz. 2 What is EAP? 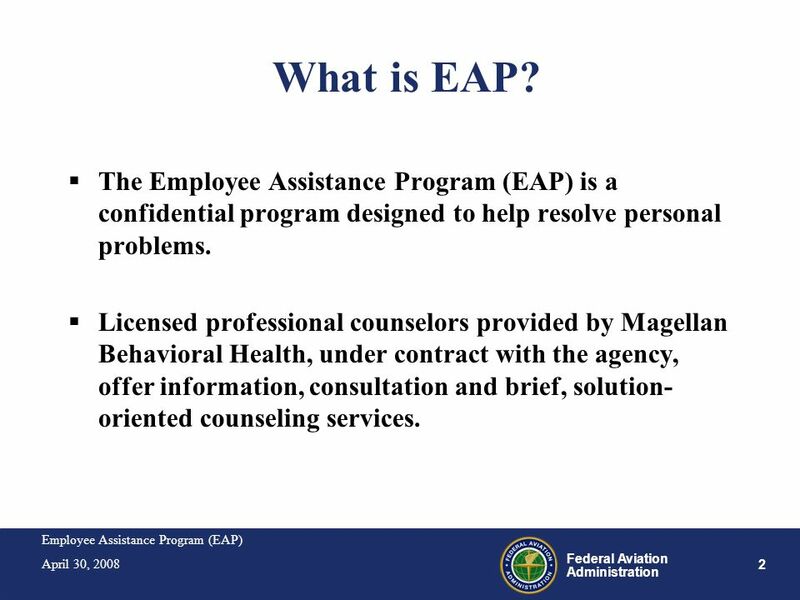 The Employee Assistance Program (EAP) is a confidential program designed to help resolve personal problems. 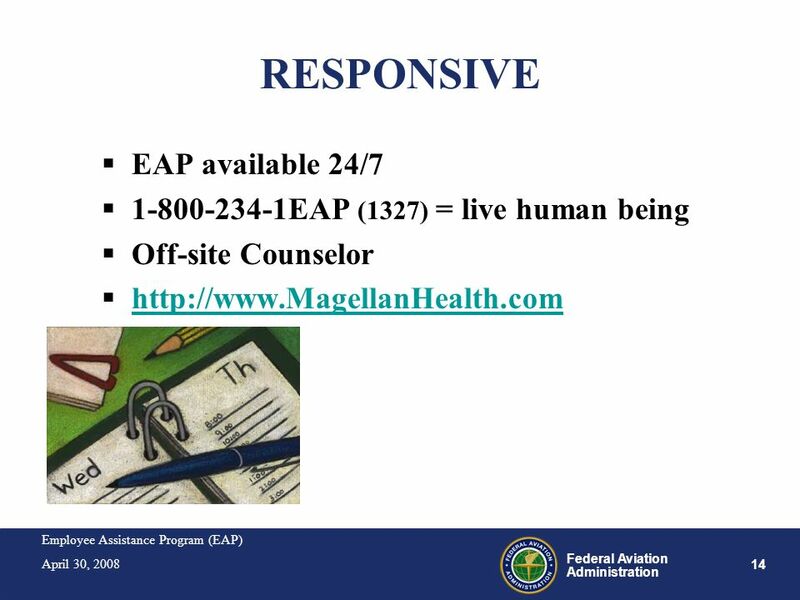 Licensed professional counselors provided by Magellan Behavioral Health, under contract with the agency, offer information, consultation and brief, solution-oriented counseling services. 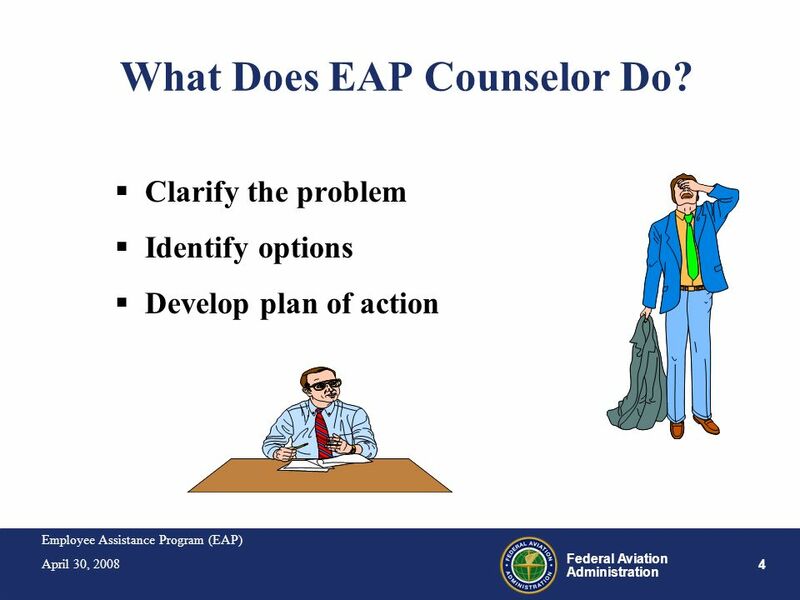 4 What Does EAP Counselor Do? 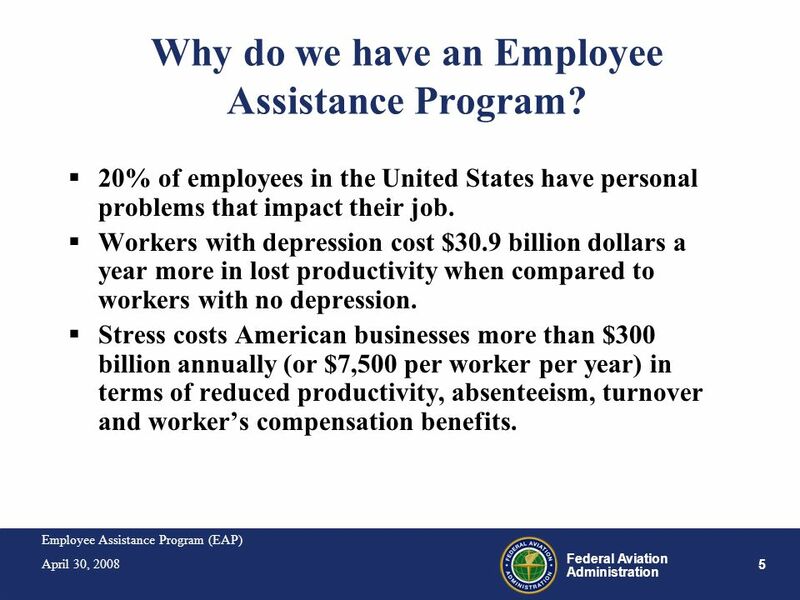 5 Why do we have an Employee Assistance Program? 20% of employees in the United States have personal problems that impact their job. Workers with depression cost $30.9 billion dollars a year more in lost productivity when compared to workers with no depression. Stress costs American businesses more than $300 billion annually (or $7,500 per worker per year) in terms of reduced productivity, absenteeism, turnover and worker’s compensation benefits. 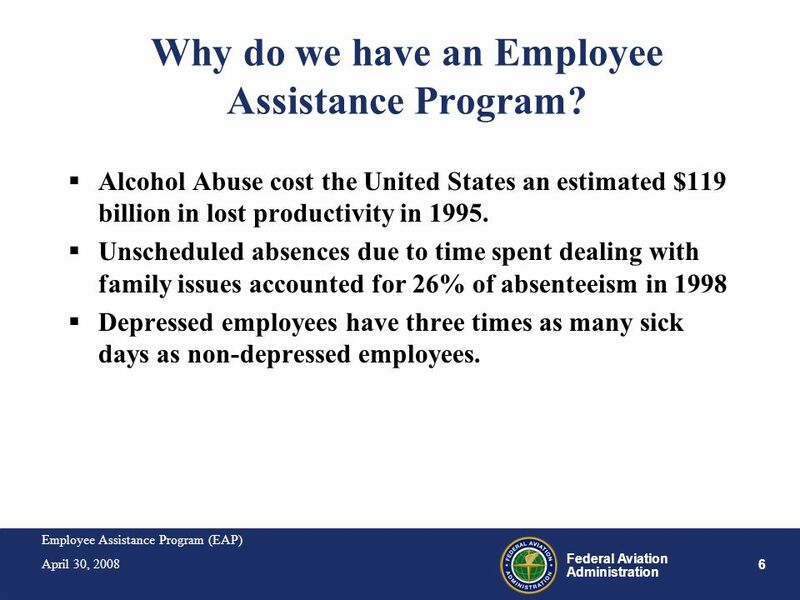 6 Why do we have an Employee Assistance Program? Alcohol Abuse cost the United States an estimated $119 billion in lost productivity in 1995. Unscheduled absences due to time spent dealing with family issues accounted for 26% of absenteeism in 1998 Depressed employees have three times as many sick days as non-depressed employees. 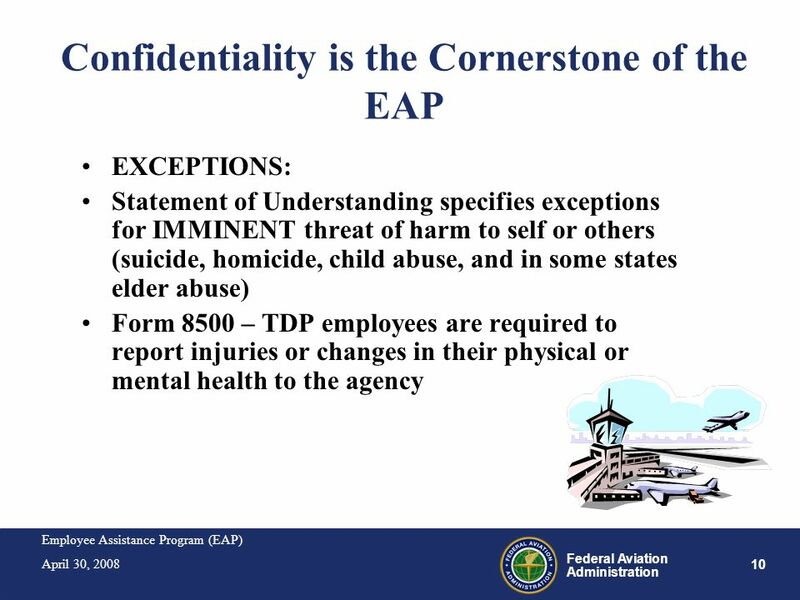 EXCEPTIONS: Statement of Understanding specifies exceptions for IMMINENT threat of harm to self or others (suicide, homicide, child abuse, and in some states elder abuse) Form 8500 – TDP employees are required to report injuries or changes in their physical or mental health to the agency We will not be covering provisions of union agreements during our training. You need to review union contracts, MOUs and MOAs to ensure there are no conflicting provisions. *Regions/centers may want to supplement with specific conflicting provisions. 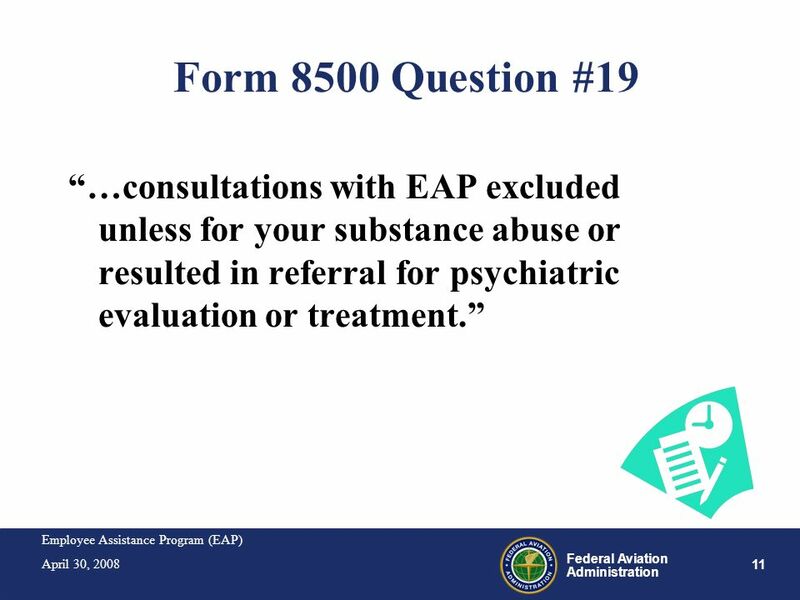 Whenever a safety/sensitive employee comes to the EAP seeking help for an alcohol or drug abuse/misuse problem, the EAP must ask the safety/sensitive employee to sign a release. 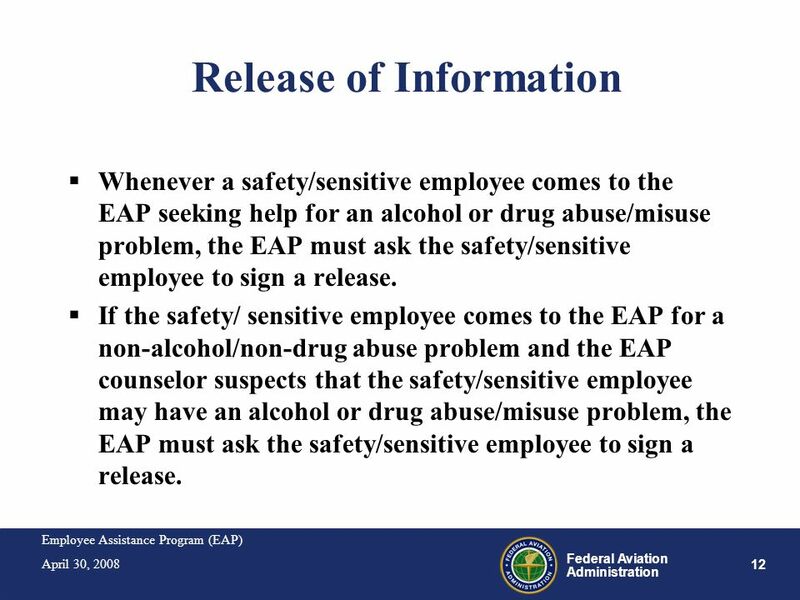 If the safety/ sensitive employee comes to the EAP for a non-alcohol/non-drug abuse problem and the EAP counselor suspects that the safety/sensitive employee may have an alcohol or drug abuse/misuse problem, the EAP must ask the safety/sensitive employee to sign a release. 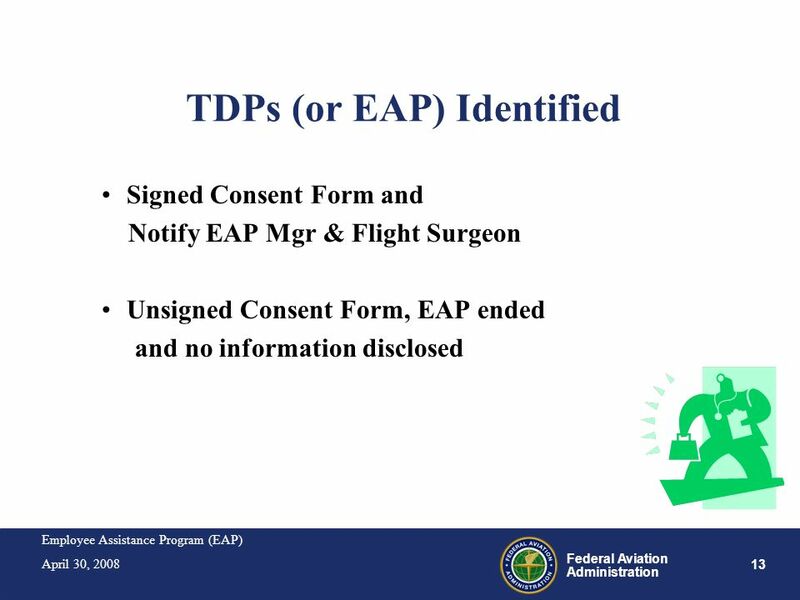 Signed Consent Form and Notify EAP Mgr & Flight Surgeon Unsigned Consent Form, EAP ended and no information disclosed The next 2 slides cover the objectives we seek to accomplish during this session. There are various types of leave within the Federal Service. Granting, determining what kinds of leave are appropriate in given circumstances, and monitoring of leave and absence is one of your responsibilities as a manager. You must exercise care in granting leave of any kind so as to minimize the effects on your organization’s mission. We hope this session will allow you to gain more in depth knowledge regarding leave including things that you must do regarding leave and things that you have discretion on. 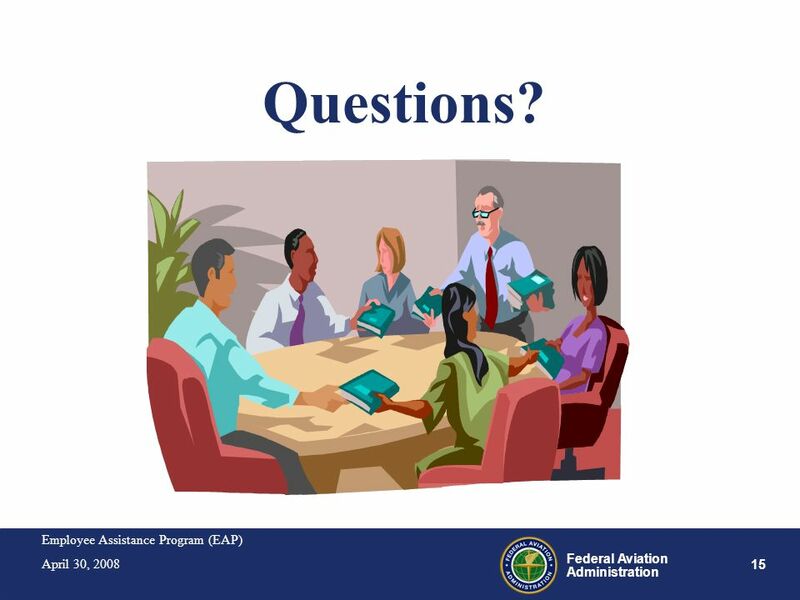 We will familiarize you with the leave policies and procedures that govern the program here at FAA. It is key that you are familiar with these policies and procedures as well as the leave provisions in the collective bargaining agreements for those of you who have bargaining unit employees. 15 Questions? We have minutes for questions. Who has the first question? Who has the next question? We only have time for one more question…who has the FINAL question? No questions – “A question past audiences have had is…” OR “One of the most frequently asked questions is…” -If I charge someone AWOL, do I have to take disciplinary action? Can someone work through their lunch and leave 30 minutes early? Thanks so much for taking a part of your busy day to spend with us and thank you for your participation. 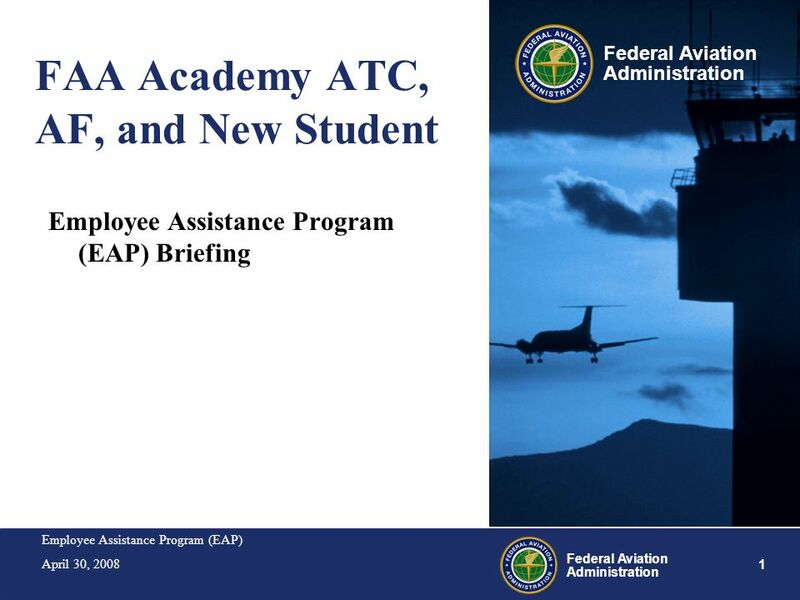 Download ppt "FAA Academy ATC, AF, and New Student"
Mental Health and the workplace March 2010 Prepared by Equality and Human Rights Commission. 1. 2 Legal Spouse; Unmarried children under age 26 An unmarried child who is physically or mentally incapacitated Please note that an individual cannot. 1 Kids Helpline Australia Wendy Protheroe. 2 Established in 1991 National Service 24/7 Private and Confidential 5 – 25 years Counselling and support via. Performance Plus Employee Assistance Programs Introduction to EAP Services. Who? What? Why? How?. tate mployee ssistance rogram 2. WELCOME An Introduction to Your UB EAP. WHAT IS THE UB EAP?  FREE benefit offered to all UB employees, family members & retirees.  VOLUNTARY, professional. 1 Washington Wellness April 17, 2008 Jan Paul, LMHC, CEAP Manager WA State Employee Assistance Program Department of Personnel Washington State Employee. FMLA What You Need To Know Brevard Public Schools Compensation & Benefits February 16, 2009. Employee Assistance Program Tools to Support You and the Employees You Supervise Supervisor Orientation. 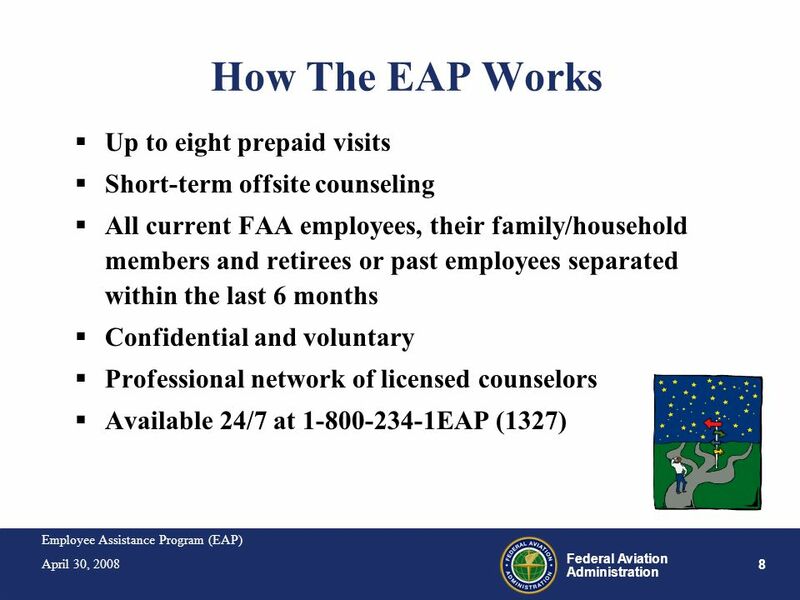 Employee Assistance Program USING THE EAP IN SUPERVISION. 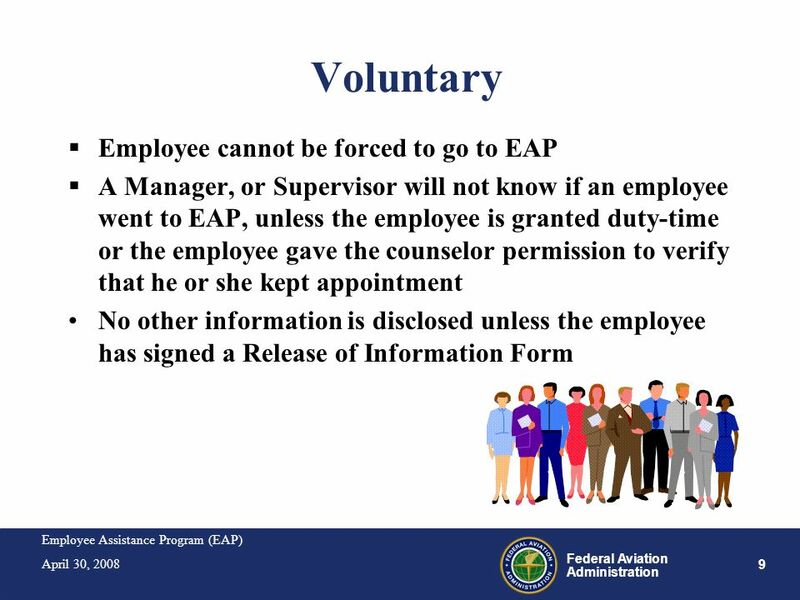 © Copyright Workers Assistance Program, Inc SUPERVISOR ORIENTATION YOUR SUPERVISOR ORIENTATION YOUR EMPLOYEE ASSISTANCE PROGRAM EMPLOYEE ASSISTANCE. A Service of InoMedic Civilian Employee Assistance Program Employee Orientation.